Emily is a consultant on Forrester's Business Technology Strategy team. She manages consulting projects and applies Forrester's research and methodologies to support client projects in the business technology (BT) domain. Emily has worked on projects in content areas across the Forrester ecosystem, including IT organizational design, omnichannel strategy, as well as BT leadership and customer experience assessments and strategies. 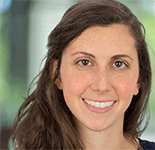 Emily joined Forrester in 2012 as a research associate serving EA Professionals. In that role, she worked directly with EA analysts and consultants, conducting primary research, analyzing and presenting data, and supporting the research process. In 2014, she transitioned into Forrester's consulting practice. Emily graduated from Fairfield University in 2012 with a B.A. in international studies and Russian studies.